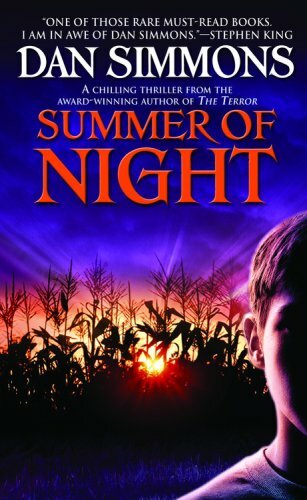 As someone who adores Stephen King’s IT, I was immediately drawn into Dan Simmons’ world in Summer of Night, with its group of kids who realize they are the only ones who can stop an ancient evil from destroying their small Illinois town. The first thing we’re introduced to is Old Central: a school with much history that is about to be torn down. When summer begins, so do strange occurrences centering around the school, including the disappearance of a student and a horrific sighting one of the boys makes through the window of the school, involving their dead teacher. Simmons fully immerses us in this world before he sets loose the chaos, letting us know who the boys are and what life is like in Elm Haven without loosening any of the tension already in place—the mark of a great horror writer. It is perhaps because Simmons is drawing from his own childhood in the real-life Elm Haven, as well as from his childhood friends for the characters, that the novel fully comes to life; nevertheless, the imaginative and fantastical elements do just as much to drive the story. When one of the boys uncovers the shrouded history of the Borgia Bell—an ancient relic connected with murder and said to be in the closed-off belfry of Old Central—the disturbances in town focus their attention on him. The others must figure out the truth, which certain adults are keeping from them, before the evil comes after them, too. Said “evil” includes the Rendering Truck, which Van Syke (school janitor and cemetery caretaker) uses to haul dead animals; a ghostly soldier in outdated attire; and mysterious underground tunnels created by many-toothed lamprey-like creatures. This book is rich, layered, complex—but also just a little too long, in my opinion. For much of the novel, the pacing keeps you right along with all of the characters as they try to solve the mystery, but there were times in the middle where it dragged just a touch. There are a few times when the boys come up with some sort of plan, but the reader is not privy to it before it is set into motion. That made me feel deliberately left out of the loop, and wondering why I cared about the scene if I didn’t know what it was they were trying to accomplish. But these are minor issues that hardly take away from the whole. And the whole is a truly entertaining and well-written horror novel. The characters are engaging and realistically-drawn; the setting of the small 1960s Midwestern town is pitch-perfect; and it all climbs its way towards a violent, action-filled, tense climax with plenty of horror to go around. I admit, I was just a little disappointed by the final revelation of the ancient evil—I think, after the buildup of mystery, I was hoping to know more about the nature of the evil—but there are bad guys aplenty to thwart the boys at every turn, and the ending is satisfying. Despite my minor quibbles, I enjoyed this one a lot, and I’m planning on reading the sequel, A Winter Haunting at some point in the future. Well-considered review but I had the exact *opposite* reaction to SUMMER OF NIGHT reading it just last month; I could barely finish it, & skipped lots of pages in the last 2/3rds! For me it was a really weak Xerox of King’s novel. Oh well! The rendering truck was nicely icky though. I can definitely understand that. There were times when I felt like skimming because the pace had slowed to a crawl during the middle-end of the book, before the climax. But there were a lot of redeeming qualities that I found to make up for it. Still, not necessarily one I plan on reading again (as opposed to, say, IT, which I’d LOVE to read again when I get the chance). Definitely could have used some editing down to make the good stuff pop more.